Royal Touch is one of the leading manufacturer of beautifully designed household plastic products. Royal Touch manufacture enticing range of plastic household items i.e. buckets, bath tubs, bath stools, soap cases, bath mugs, basins, bins dustpans etc in a spectrum of amazing colors and fabulous designs. Our primary objective is to achieve excellence in every sphere so that we share relationship of trust and confidence with our clients. We give immense focus on the specifications of the buyers and design products as per their requirements. All the products are made from best quality raw material under the supervision of expert and professionals. We are an ISO 9001 : 2000 certified company. For us quality is a virtue that we can never give up. We constantly endeavor to achieve total flawlessness for each and every product that we offer. In order to produce quality household items, we have built up a strong quality management team. They ensure that every product of ours is scrutinized at each and every level of production. Further the effective use of best quality raw materials also help us deliver the best possible quality to our clients. Following the constant evolutions and changing trends of the markets, we always tend to experiment and indulge into new ideas assuring our clients of procuring from us the best range of products at market leading prices. We have a good and fully equipped warehouse, which helps us in providing safe storage facility for our finished products. Further we also provide packing facility for our plastic appliances. We have the expertise in providing the packaging in standard as well as in customized specifications as per the demands of our clients. Transportation We have with us well-developed transportation facilities. The company has been able to establish good connections and hence a strong networking system with a number of transport houses. This aids in timely delivery of all our consignments to the esteemed clients. Further our transportation abilities also helps us to procure our raw materials on time. Our different teams include: Plastic Technicians: They help us to identify and procure good quality raw material. They also help to develop the the raw plastic into its usable forms. Designers: A qualified and creative team of designers ensure that we produce attractive looking plastic ware in vibrant color combinations. Skilled and Non-skilled labors They are possibly one of the most important links of the organization, as they execute all the plans that have been made at the managerial levels to perfection. Chemical & Polymer Engineers: They are responsible for proper identification of raw material and blending the chemicals to perfection for attaining the proper finish and desired durability. Apart from these we also have other back hand staff who help in various aspects of work in the organization, which include: Administration, HR, Accounts, Housekeeping and the Personal Department. We have a huge & exciting range of premium quality products that have world wide acceptance and reputation for their fine & smooth finish & durability. Our exhaustive range comprises of: Frosty Bath Sets, Jumbo Bath Sets, Fancy Patlas, Bath Mugs, Dust Bins, Frosty Bins, Deluxe Quality Baths, Frosty Buckets, Stripe Buckets, Frosty Bath Tubs, Bath Tubs and many more. Our innovative user friendly designs, aesthetic colors, durability and competitive prices makes us an obvious choice for our customers. 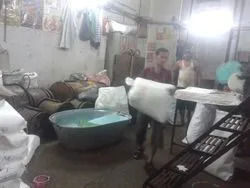 Being a quality oriented production firm, we believe that the first step to produce flawless and good quality products is to procure the best quality of raw material. Hence we procure only the finest quality of raw material from local markets. The various chemicals that we use to produce the plastic, which is further used in the manufacturing of the final finished products are: Acetophenone, Amino Guanidine Bicarbonate, Ammonium Persulfate, Bronopol, Butane Diol, Calcium Gluconate, Diethyl Carbonate, Dimethyl Malonate, Tartaric Acid, Formamide, Gamma Butyrolactone etc. Royal Touch Plastic is an ISO 9001-2000 Certified Company and actively engaged in making wide variety of products which are made from the premium quality durable plastic Household Products - Buckets, Dustbins, Planters, Dust Pans , Bath Mugs, Frosty Tubs, Fancy Stools, Containers, Bowls, Thali, Serving Plates and Bath fancy Stools and Luxury ware Microware Products. We are a group of diligent professionals and work towards to achieve client satisfaction. 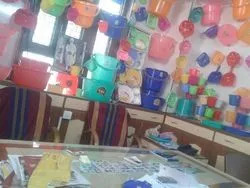 We have adopted modern work methods for fulfilling high-end requirements of our clients - Jyothy Laboratories, Mieoux Detergents, Nikhar Detergents, Super99, CityLife, Future Retail, Vishal Mega Mart, V Mart, Nysaa Retail etc. We have a highly organized working environment that enables to meet exact requirements of the clients. We have adopted modern work methods and tools that are operated by the trained workforce. Our products are designed, developed, packed and distributed by diligent professionals who have the potential to attain perfection in all aspects. We have also parted it into several units for the ease of operations. For us, quality is the prime concern. And, for maintaining this in all our offerings, we make use of the best quality raw material for product development. The production process is carried out by skilled workforce who keeps strict control over the quality and perfection.